2 Slices of Pizza OR Hot Dogs & Chips per guest. A $285 Deposit is required to secure online reservation. Full deposit is required at the time of booking. We accept Visa/MasterCard. SORRY, NO REFUNDS. If you have any questions about your Birthday Party, or would like to make a reservation over the phone, please call 510-623-7200 or EMAIL us. Special requests can usually be accommodated with advance notice. 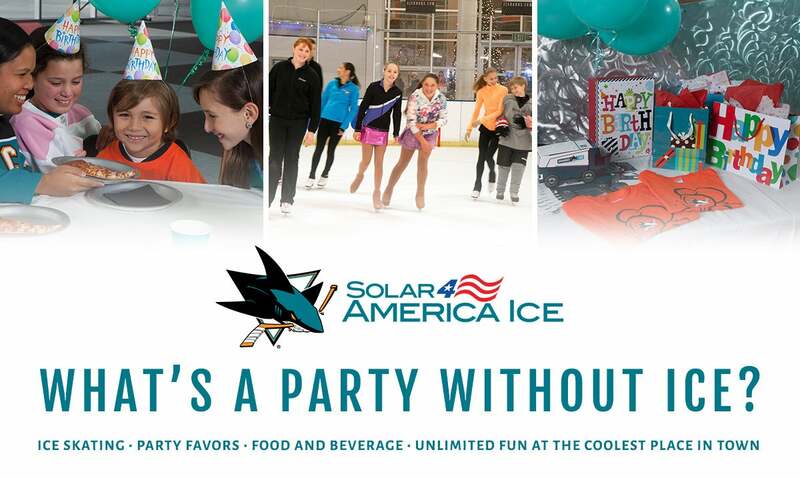 Download the Sharks Ice invitation to Party With The Sharks! Mail or distribute to all party guests (includes map and contact information for Sharks Ice). Print, Fold, and Mail your invitations to get your Party With The Sharks started!! We require a deposit of $270.00 to book your child’s party. The $270.00 will be applied to the cost of 10 children in the party package. We accept Visa, MasterCard, cash and check. Parties are first come, first served. Party date and time is considered confirmed once a credit card has been put on file for the deposit of $270.00 or has been processed from online booking, and a confirmation from the Party Coordinator has been emailed to you. Upon payment, you agree to the following terms and conditions. We allow a store-bought cake, cupcakes or other dessert for your child’s birthday party. We have both a fridge and freezer to store your dessert. We cannot allow any other outside food to be brought into our facility due to the County Health Code and facility rules. If you do not find what you are looking for on our Catering Menu, the Party Coordinator would be happy to work with you on providing other options for your party. Candy in goodie bags is acceptable. Food restrictions due to allergies or religion should be brought to the attention of the Party Coordinator and limited arrangements can be made. Please note that certain agendas may be requested, but the Party Coordinator will assign agendas based on the number of birthday parties for the day and their ages. Sample Party Agenda based on Saturday and Sunday parties, times may vary slightly. Guests arrive and are directed to your party. The guests will join us in bucket area for some Birthday Party Games centered towards our younger crowd. Games include the Hokey Pokey, Chicken Dance, and the Macarena! Guests will join us back in the Party Room for Pizza. Party guests will also get to build their very own Zamboni to take home! All of the guests will join us back on the ice for some more fun including the Limbo and the Cha-Cha Slide! Your guests will finish the party in the Party Room with cake and presents! What’s better than that? Don’t forget the candles! 12:00 Welcome to Solar4America Ice! Your guests will finish the party in the Party Room with cake and presents! Party guests will also get to build their very own Zamboni to take home as well. Reservations must be made through our online registration page found above - please be sure to create an account before attempting to reserve a spot. Once you create an account, you can search for a specific date to see which slots are available. After you select one and pay the deposit, the Party Coordinator will send you a confirmation email. If a certain slot is not available, that means it is either already booked or we are not doing reservations for that time frame. If you have any questions about reserving a party, you can email the Party Coordinator at [email protected], or call (669) 800-6462. Upon booking the deposit, $285.00 for the minimum of 10 kids is required. If you have additional kids or would like additional food that can be taken care of the week of the party with the Party Coordinator. If you would like to order food from our catering menu, that must be done by the Thursday before party date. $285.00 deposit is non-refundable. Parties can be rescheduled based on availability. If they are not skating or eating there is no additional cost for them. If you would like to provide food for the parents, that is just the cost of the food. If the parents would like to skate they can go to the front desk and pay for their own admission for $17.00 per person or they can be added to your bill for $14.50 per person. What if I am inviting more than 10 children? Each additional child added to the package will be $28.50. We recommend no more than 30 children for one party, as space in our party area is limited. The birthday child is included for free in the Hat Trick Package. The deposit for 10 guests is due at the time of booking does not include the birthday child. We recommend that our guests are at least 3 years of age; however, there is no minimum age to participate in a birthday party. Please note that the smallest skate size for toddlers is 7. If you would like to bring in additional decorations such as balloons, banners, etc. you are more than welcome to. We do not allow decorations hanging from the ceiling or loose glitter. If you would like to bring in additional goodie bags to go along with our party favors you are more than welcome to. Small goodie bags or candies fit really well into the Zambonis included with the package. No outside food or drink is allowed, except for a store-bought birthday cake or cupcakes with the purchase of a party package. You are welcome to bring bottled water, but we do provide pitchers of water at no cost. I want my party in Stanley's. How do I reserve that? While we can take requests for certain party areas, we cannot guarantee their availability. Each party area is booked based on the size of the birthday party, and how many parties have been booked for that particular day. Please contact the Party Coordinator for further information. What deposit is required at the time of booking? Upon booking the deposit for the minimum of 10 guests, $285.00, is required. Parties may not be reserved without a deposit. Do you offer any discounts on birthday party packages? We currently do not offer discounts on birthday party packages. Skaters tend to warm up while skating, so we recommend dressing in layers. Pants, long socks, long sleeve shirt and a jacket are always a good idea. Many of our guests also wear mittens, hats, and scarves. You are also welcome to bring protective gear, such as a helmet and knee/elbow pads. Unfortunately we do not provide protective gear such as helmets, elbow or knee pads, but you are more than welcome to supply your own. Many children bring their bike helmets. 2 For 1 Coupon: for guests to use on their next visit to Sharks Ice.